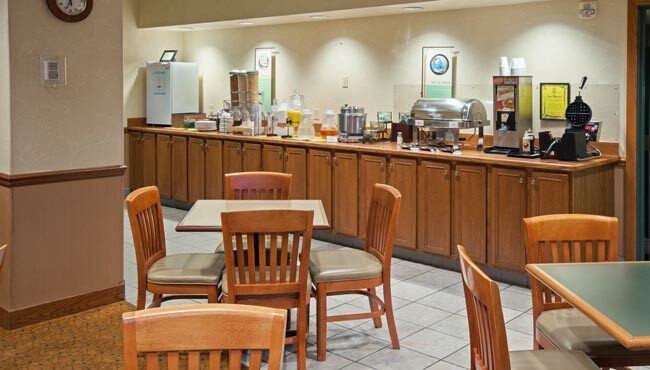 Smother a golden waffle with butter and syrup or bite into a flavorful breakfast burrito at our free, hot breakfast, served each morning at the Country Inn & Suites hotel in west Lansing. You can keep your meal on the lighter side with a yogurt and a piece of fresh fruit or grab hard-boiled eggs and turkey sausage links for a heartier plate. For lunch or dinner, try nearby restaurants like Tony M’s, which dishes out comforting Italian favorites like specialty pizzas, spaghetti and meatballs, and shrimp scampi.